In its inaugural year, the Alumni Innovation program is providing six worthy alumni teams with seed funding to begin their trans-boundary efforts. The goal of the Alumni Innovation Program is to empower our graduates to fulfill the mission of the Institute, building bridges between people in the Middle East based on mutual environmental concern. The Innovation Program enables alumni to engage in cross border and cross cultural business, and social initiatives creating a network of relationships that support sustainability and stability in the region. Initiatives were selected on the basis that they would provide an environmental or social benefit to people in Israel, Jordan or Palestine. The initiatives are both environmentally sustainable and financially sustainable. The projects all have measurable goals that can be achieved within the timeframe and scope of the project. Participants submitted a business plan outlining how the funds will be allocated and a work plan with measurable goals, a time line and milestones for achieving the goals. Grants have been awarded to six teams of alumni representing either a cross border initiative between Israelis and Palestinians or Jordanians, or a cross-cultural initiative within Israel between Arabs and Jews. 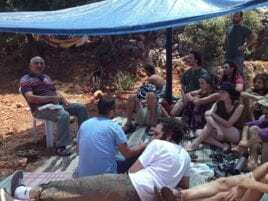 Yaarot Menashe Art Festival: Artistic-Environmental Dialogue: The two-day workshop will feature Jewish and Arab artists from neighboring communities and from the Alumni community. They will meet in a natural setting, engage in open dialogue, and create individual and collaborative works of natural art or “land art”. The working process will be open to the public. Neighboring communities will be invited to take part, and the art will be exhibited as part of the Menashe Forest Festival. Jalilah Ecological-Education center in the Western Galilee: The Jalilah center will be a model for sustainable living and demonstrate that proximity to nature does not mean downgrading lifestyle. It will be an embodiment of a sustainable life in a holistic approach – connection with oneself, with our local environment and with our social environment. It will be a meeting place for the local Arab and Jewish communities to meet and build relationships between themselves and with their environemt. Educational activities for schools from both communities will take place, and courses and workshops on sustainable living will be offered to locals and others. “Reinventing Roots”: a permaculture education program for the Bedouin Community: Reinventing Roots will provide economic empowerment through sustainable education to underprivileged communities with a specific focus on Bedouin communities in Israel. Programs will enable community members to practice and teach cultural crafts and skills to encourage the continuation of cultural heritage, which are in-tune with the local environment and climate. The programs will be open to the public on an international scale giving participants a peek into the last glimpses of land-based lifestyle. The interaction between the local community and the international community will bring a dynamic blend of ancient knowledge and modern ecological innovation. “Art Knows no Borders”: An ongoing organization that develops and hosts annual art festivals, with a rotating series of locations in Jordan, Israel, and Palestine: Art Knows No Borders addresses the present scarcity of cross-border art interaction by establishing an ongoing organization to develop, promote, and host an annually recurring arts festival. There will be art workshops in Amman and in the West Bank. Boro Energy: The team will develop a prototype to produce hydrogen gas on-demand, using a metal-water splitting reaction which they will then patent and sell. The technology will use affordable and abundant aluminum metal to produce the hydrogen at a variable rate that meets the application’s consumption requirements. This project is a commercialization of the research that the team conducted at the Arava Institute under the supervision of Dr. Tareq Abu Hamed. Compassionate Conservation in the Palestinian Authority: An NGO for Animal and Nature Conservation based in Palestine, with collaborative projects between Israel and Palestine. The approach of “Compassionate Conservation” breaks new ground by transcending the ongoing dilemma of choosing between animal welfare and conservation. It looks for synergy between these two approaches to improve conservation and wildlife management. Tel Aviv University will host the new center and a number of local research projects, publications and lectures.